On my way home one day, I noticed that sugar apple fruits are already being sold in the streets. This sweet fruit, which is locally known in the Philippines as “atis fruit,” is round; slightly pine cone-like with a scaly or lumpy skin. It is internationally known as “sweet sop” and “custard apple.” This fruit has high fructose content which contributes to its sweet taste. 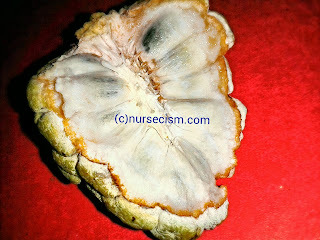 I remember that we have atis tree before but it withered due to pests. According to Wikipedia, the tree requires a tropical or subtropical climate with summer temperatures from 25 to 41 degrees Celsius. It is sensitive to cold and the tree might die under temperatures below freezing point. No wonder why the Philippines is a perfect place to cultivate it. Good source of vitamins and minerals. Atis fruit contains amino acids, calories, ascorbic acid, lysine and phosphorus. The seeds of atis can be pounded, mixed with coconut oil or water to make a paste and applied to the head to get rid of lice. Be very careful not to bite and swallow seed kernels though as they are reported to be toxic. The paste of seed kernels can even induce abortion when applied on the uterus. Unripe fruits may be pounded and its juice may be used to treat insect bites. Decoction (a liquid preparation made by boiling) of the leaves can help treat dysentery or even dysmenorrhea. It may also be used during bath to alleviate rheumatic pain. Crushed fresh leaves may be used for people who fainted by letting them sniff/smell its aroma. Juice of Atis's pulp may be used to expell intestinal worms. The decoction of roots may be used as a purgative/laxative. A lotion derived from atis, as proven in a study conducted by Department of Science and Technology (Philippines) and Philippine Council for Health Research and Development, is an effective mosquito repellant. The fiber content of atis helps in controlling sugar levels. Do you like Atis too? If you know other benefits of this fruit that you want to add to this list, feel free to let us all know through the comment box below. Kala ko apple talaga na mas matamis. LOL! Sugar apple pala ang english term ng atis. Atis is really tasty and also very healthy. It has many alternative uses. Atis reminds me of my younger years. We have an Atis tree beside our house and I always ate it. Didn't know it can provide a lot of good nutrition like what you have mentioned here. Oh, I miss atis. It has been over a decade since the last time I had some. No! Unfortunately, ayoko ng atis. My grandma has atis trees kaya while I was growing up, maraming supply sa bahay namin pero never ko nagustuhan. LOL I guess I need to try other fruits nalang..
Oh my Atis! Isa ito sa namumungang puno d2 sa aming bakuran, this is the season of atis kaya every morning nkatingala kmi s puno at nangunguha ng hinog,paborito nmin ito dhil s msrap na lasa..kaya gato ko mlman kun ano ba benefits na mkkuha d2 and then i read all this info.. And wer so bless to have an atis here in our backyard.